Bush Views California's Wildfire Damage With a million people evacuated and more than $1 billion in damage in San Diego County alone so far, President Bush toured the Southern California fire sites. 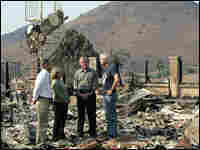 President Bush (second from right) visits with Jay (right) and Kendra Jeffcoat while touring the remains of the Jeffcoats' home with Republican U.S. Rep. Brian Bilbray (left) in San Diego. Hear Jay and Kendra Jeffcoat at the site of their destroyed home. 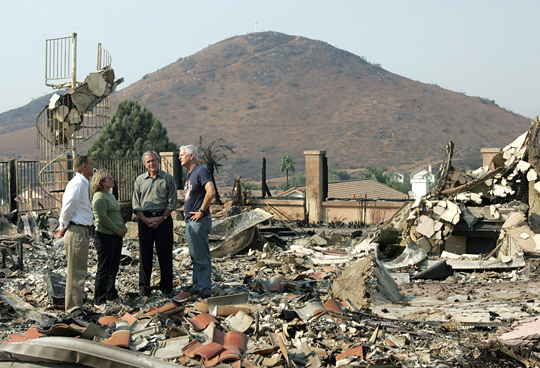 With a million people evacuated and more than $1 billion in damage in San Diego County alone so far, President Bush toured the Southern California fire sites. 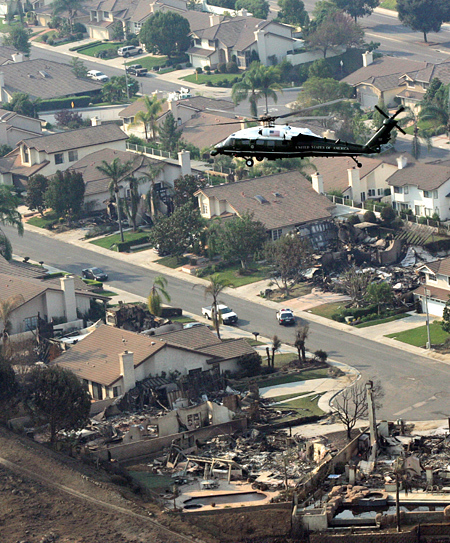 The president flew in Thursday morning and took a helicopter to the scene of the fires. 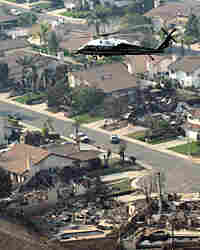 He then landed and toured some of the worst scenes of destruction in the San Diego suburb of Rancho Bernardo, at one point speaking to Jay and Kendra Jeffcoat near what used to be their home. "For those of us here in government, our hearts are right here with the Jeffcoats," he said. The president also visited with workers at an aide station where officials and private agencies were working together to help burned-out residents.